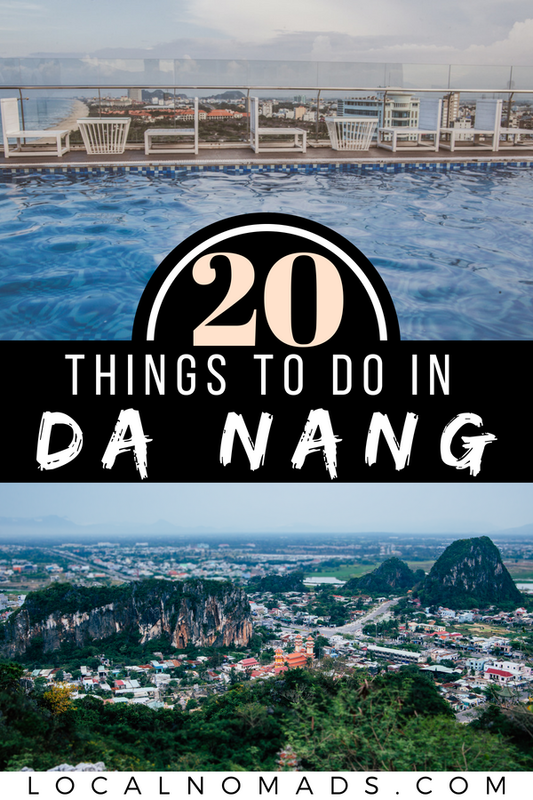 At first glance may seem that there aren’t a lot of things to do around Da Nang. Many travelers, merely pass through for 24 - 48 hours or skip over it completely in anticipation of seeing beautiful Hoi An. But we're here to change your mind. Da Nang is highly underrated, which is why we spent 5 months living in Da Nang. 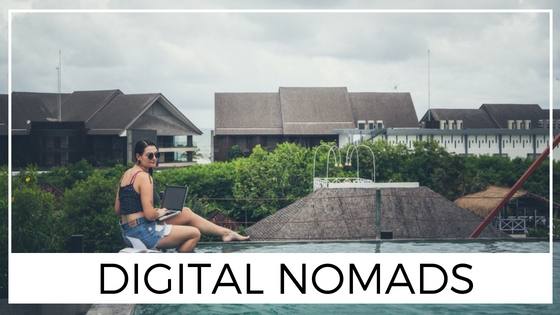 Da Nang is a chilled out modern city that is changing every week. This means that there are new gems popping up all over town. 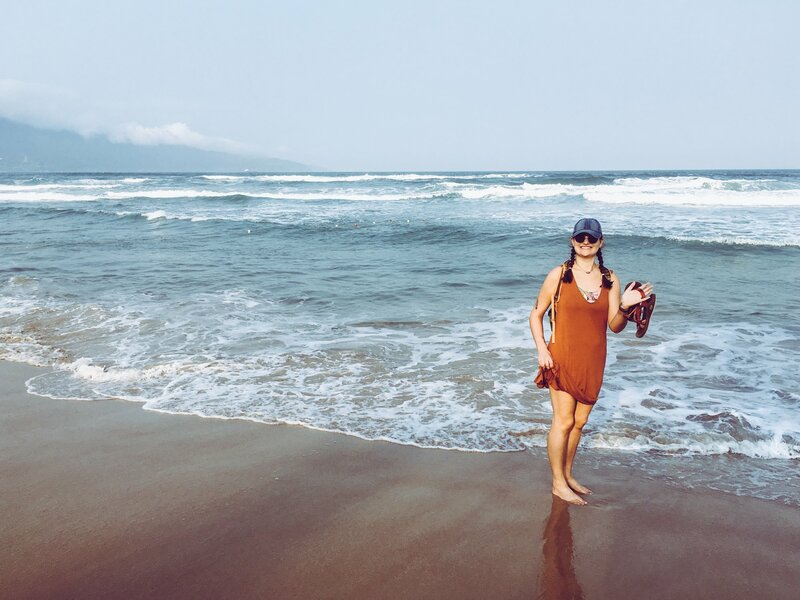 There is plenty to discover in Da Nang, but a big part of its charm is the relaxed pace of day to day life in comparison to other large Vietnamese cities. There's always something to do whether you enjoy exploring the coast by motorbike, relaxing on the beach, sipping cocktails, or chilling out with the locals in a cafe. 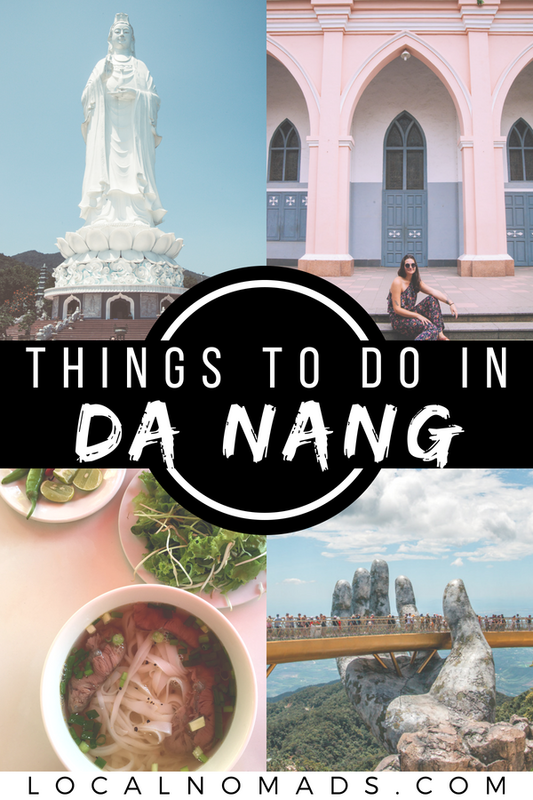 Da Nang has something for everyone! It's easy to get off the beaten path if you try. 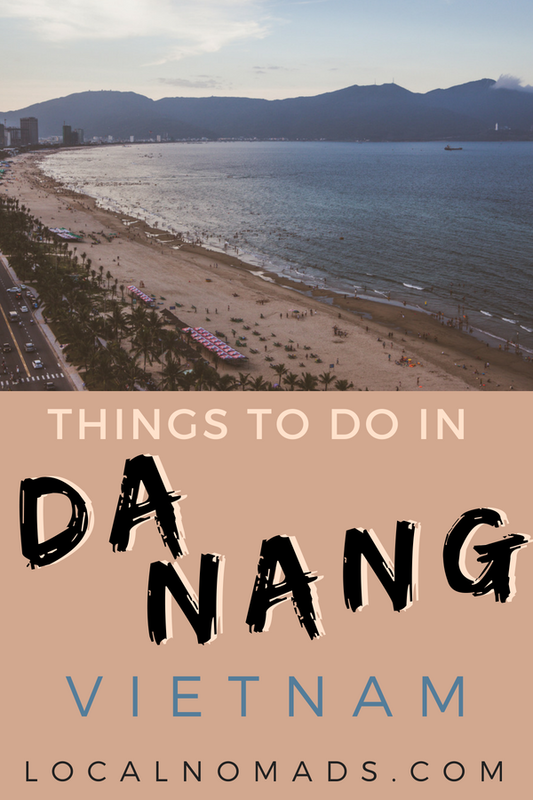 We’ve compiled this list of Da Nang attractions help you explore Da Nang City and to get you out to some awesome natural highlights and off the beaten path. 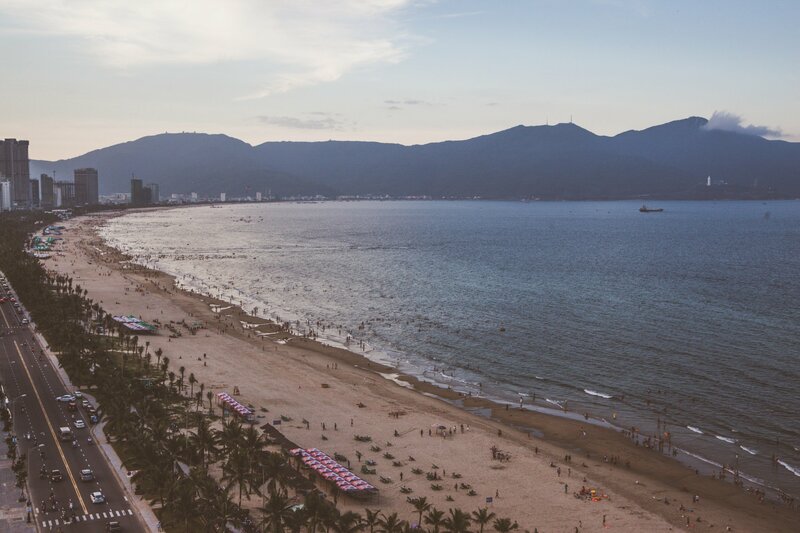 This article will prove to you that Da Nang is worth spending at least a few days in. Maybe even a few months! Did you know that Vietnam is the second largest coffee producing country in the world? That may explain this country’s obsession with the stuff. Coffee is life in Vietnam. Perhaps you’ve tried Vietnamese coffee (Ca Phe Sua Da) at your local pho restaurant back home. If so then you’ll know how addicting this mixture of strong drip-brewed coffee and sweetened condensed milk can be. Well, you’re in luck. You can get a great cup of Vietnamese coffee for about a dollar on just about any corner. For those of you looking for a cup of coffee with an Italian style for sipping on, there are a number of great specialty coffee shops serving high quality, single origin coffees from Vietnam and your other favorite coffee producing regions of the world, at a fraction of the cost you’d pay in the West. Don’t miss Why Roastery, Brewman Coffee Concept, and Gold Star Coffee! 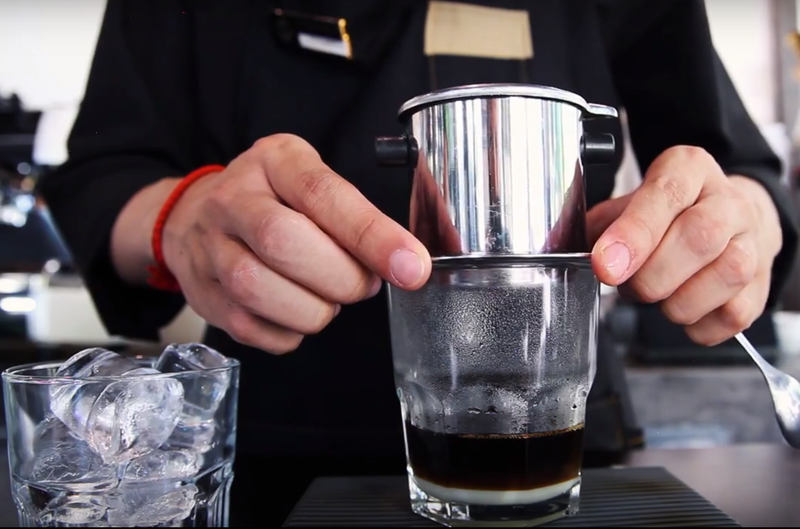 Never had a cup of Vietnamese Coffee? 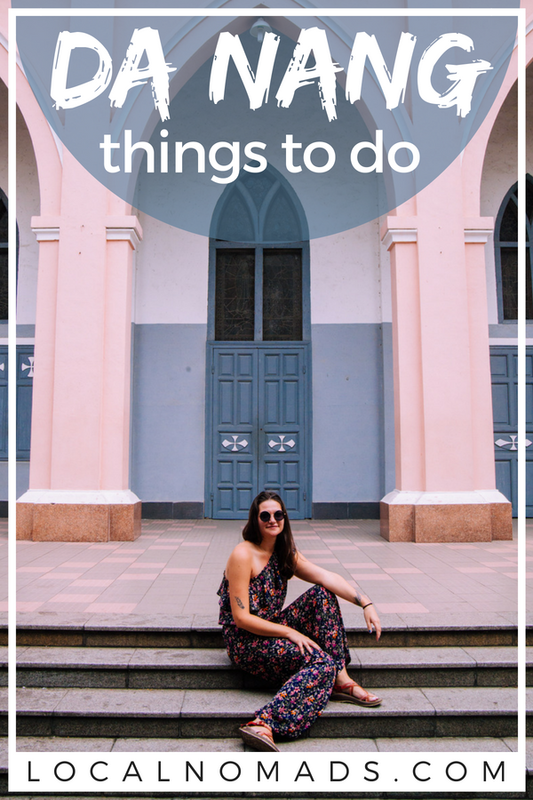 Neither of us are church-goers and we don’t really spend much time visiting temples and religious buildings… so why are we telling you to visit the Da Nang Cathedral? 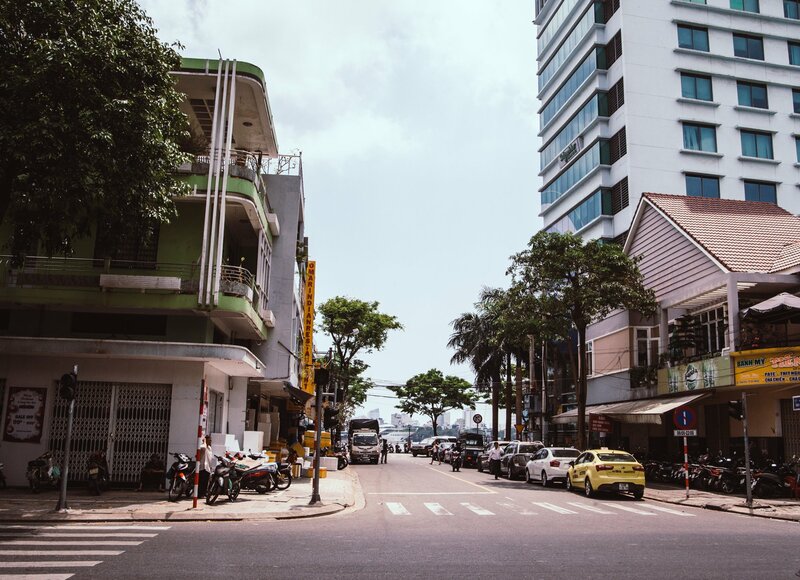 While the traffic in Da Nang isn’t nearly as intense as Hanoi or Saigon, the main roads and thoroughfares can often be congested and noisy. We suggest getting off the big streets and opting for the smaller winding alleys throughout Da Nang. Often you’ll find many small neighborhood restaurants and local businesses, much less traffic and noise, and glimpses of Da Nang’s history. 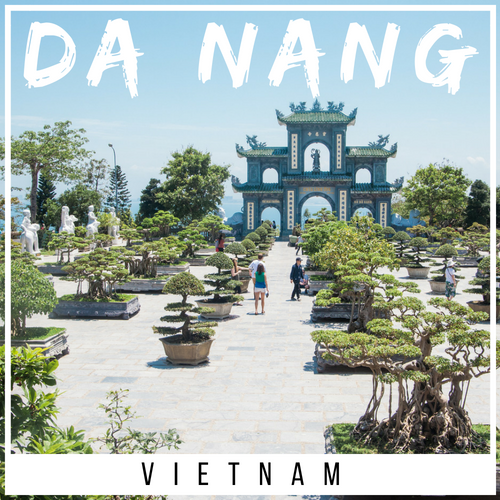 Are you looking to get an insider’s perspective on Da Nang? 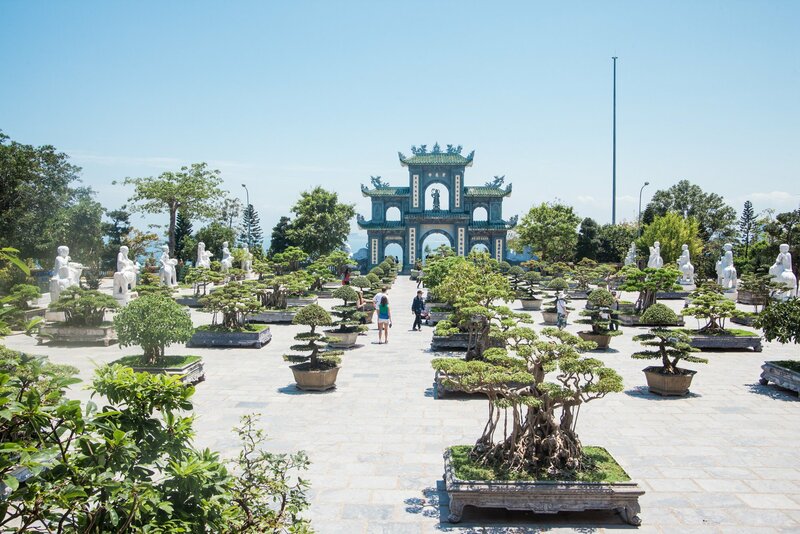 Try the Da Nang free walking tour! The tour lasts an hour and a half, and you’ll have the chance to meet some of the local university students who’ll be guiding you around. Don’t be afraid to ask them questions as they’re very knowledgeable about the city and they speak English well. 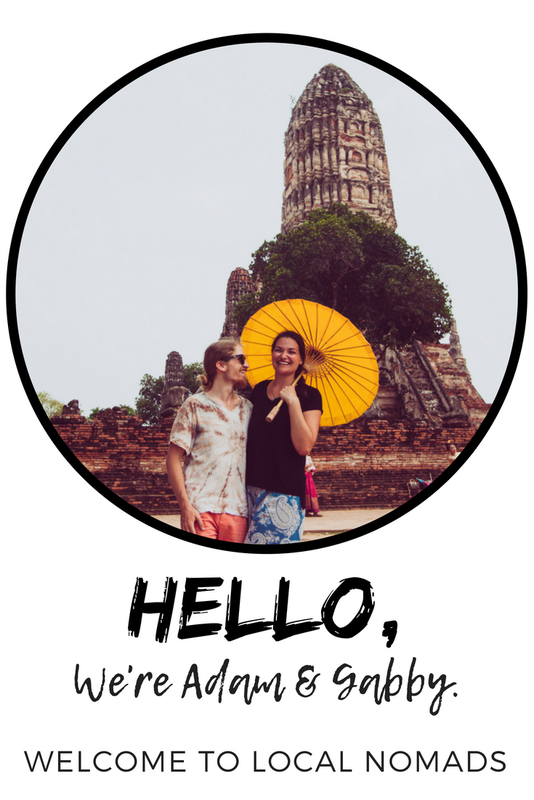 Ask them for recommendations about great places to eat and other things to do for the rest of your stay in Da Nang. The tour is free, so just be sure to tip your guide at the end of the tour! There are many small neighborhood back alley markets to explore in Da Nang, but one of the larger local markets where we frequently bought our spices and vegetables was just a short walk from our neighborhood in An Thuong. 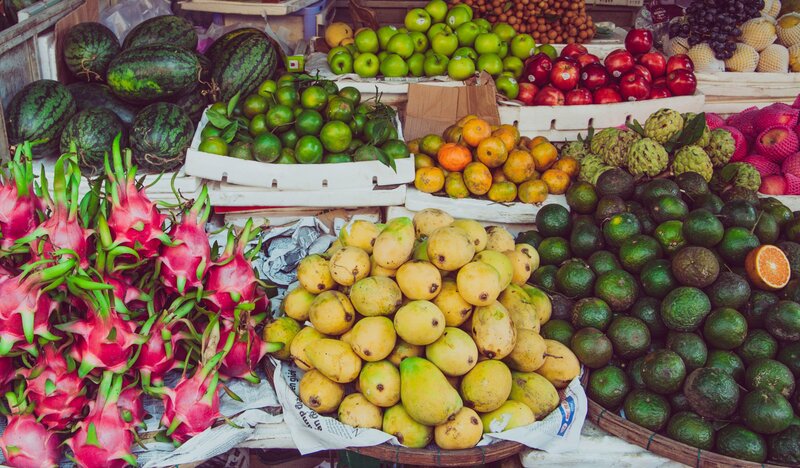 The My An Cho Bac is a great place to explore with many local stalls selling everything from various cuts of meat and poultry, fresh rice noodles, a cornucopia of local fruits and vegetables and spices, and today’s fresh ocean catch. 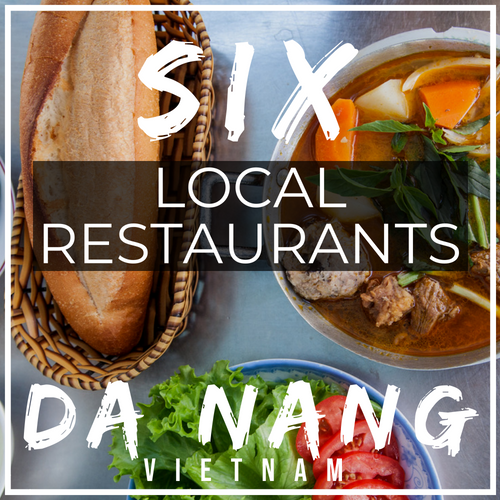 You can also grab a quick lunch here, with local noodles specialties like Bun Mam, Mi Quang, and Bun Thit Nuong, but this isn’t our favorite spot for dining, and the atmosphere is not as welcoming. There are endless options of great local foods to try in Da Nang, especially on the West side of the river. Just pull up a plastic or metal stool and order one of whatever it is they’re serving. Don’t be afraid, just walk in, greet the person with a friendly “Xin Chao (pronounced sin-chow)!” and find a seat. Some places will have a menu for you to look at, others will just ask you what you want to eat. If you don’t know the food names, there will probably be a picture on the wall that you can point to. If not, just point to what someone else is eating and ask for one of those. As always, look for restaurants that are busy with locals, that way you know you’re getting the real local specialties. 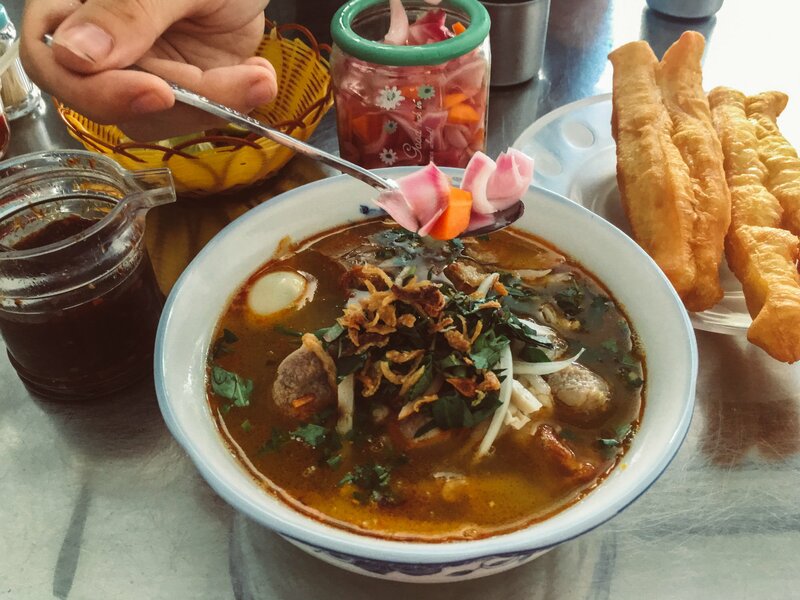 If you’re looking to dive ears deep into Da Nang’s local food scene, there’s no better way than Summer Le’s Funtastic Food Tour. 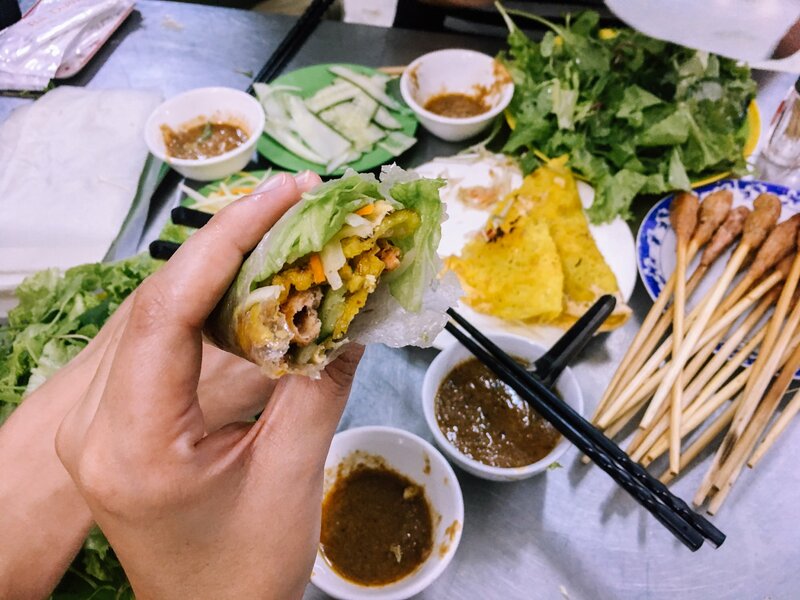 Summer is passionate about introducing Da Nang’s local specialties to curious foreigners looking to dip their taste buds into the world of Central Vietnamese Cuisine. The tour will take you to 4-5 different local spots including dessert! Bring your appetite, you don’t want to be full after your first dish! Book your Funtastic Food Tour here. One of our favorite lazy day activities in Da Nang is munching on pastries and sipping tea 18 floors above the city. Enjoy 360 degree views of the city and coastline as you stuff yourself with unlimited pastries, fresh fruit, and tea for just 60k dong or $3/person. If you’re not a fan of tea, fear not, they also have coffee! Don’t forget to bring your camera so you can show off your posh lifestyle to your instagram followers. Once you cross the Dragon Bridge from the East Side to the West you’ll realize how remarkably different these two sides of Da Nang are from one another. While the East side tends to be quieter and more neighborhoody, the West side is a bustling metropolis. Locals go about their daily business setting up their shops and eateries along the sidewalks. In the daytime, the area along the West of the Han River is great for walking and checking out the riverfront skyline. **TIP** Sit down for a breather at CONG Caphe for one of their famous Coconut Coffees. This sweet creamy blended coffee beverage is exactly the boost you need on a hot day. Nowadays, you can order a coconut coffee at just about any of the cafes around town, which is good to know since you’ll be addicted to them after you visit CONG CaPhe. Head to the East side of the river in the evening, to catch the sunset. When it gets dark and the lights come on the riverfront comes alive. 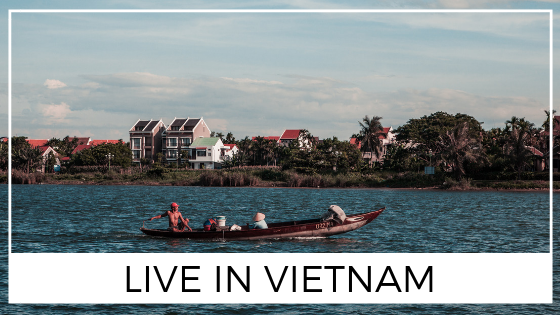 Spend hours watching the LED covered boats gliding up and down the river or just take in the free rainbow light shows on Da Nang’s bridges and many colorful hotels. Sometimes you just need to sip a cocktail in style. Before Da Nang, we’ve never lived in a place with such easily accessible rooftop pools. 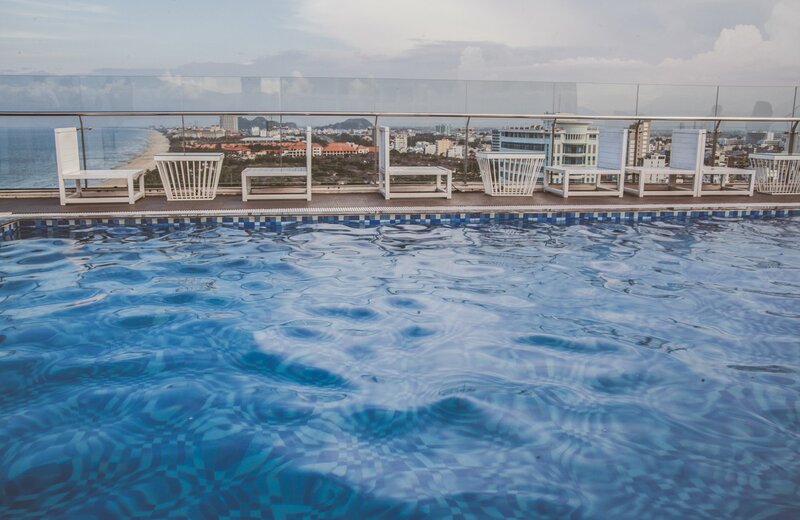 Our favorite so far is the 18th floor of the Adamo Hotel, where you can swim and overlook the beach for just the price of a drink. From our experience there usually aren’t too many people there, they offer free towels to dry off with, and the views can’t be beat. The 4th floor rooftop patio at 7 Bridges Brewery, on the Eastside’s riverfront, has unbeatable views of the river and dragon bridge at night. I always treat myself to an Imperial IPA while we’re there, Gabby tends to order the Red Ale. Both favorites! 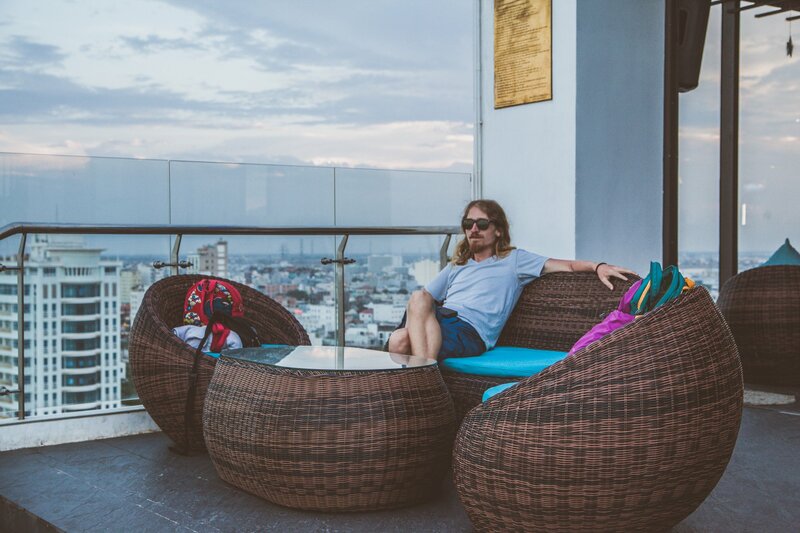 If you want to kick your night up to eleven, or impress your date, take her to the Sky 36 Club on the roof of the Novotel. This place has more of a night club atmosphere with 3 different floors, deep house and EDM music, neon dancefloors, and vip lounges. There’s no cover to get in, but the drinks can get pricey. With a river splitting the city in half it’s no wonder Da Nang has so many bridges to connect the two. Each bridge has its own dynamic characteristics, but Da Nang’s Dragon bridge is definitely the most unique bridge design we’ve seen in our travels. It looks like a giant yellow dragon crossing the river. If you’ve got a motorbike, riding across the bridge can be a lot of fun. If you don’t have a motorbike, you can order a grab bike to take you across the bridge, and get an up close view of this really cool structure. At night the Dragon Bridge changes colors, adding to the riverfront’s evening magic. On Saturday and Sunday nights the bridge actually breathes fire and water over an eager audience. Be sure to get there early to get a good spot, and be aware that the bridge will be closed one hour before the fire show begins, so don’t get stuck on the opposite side of where you’re trying to be. 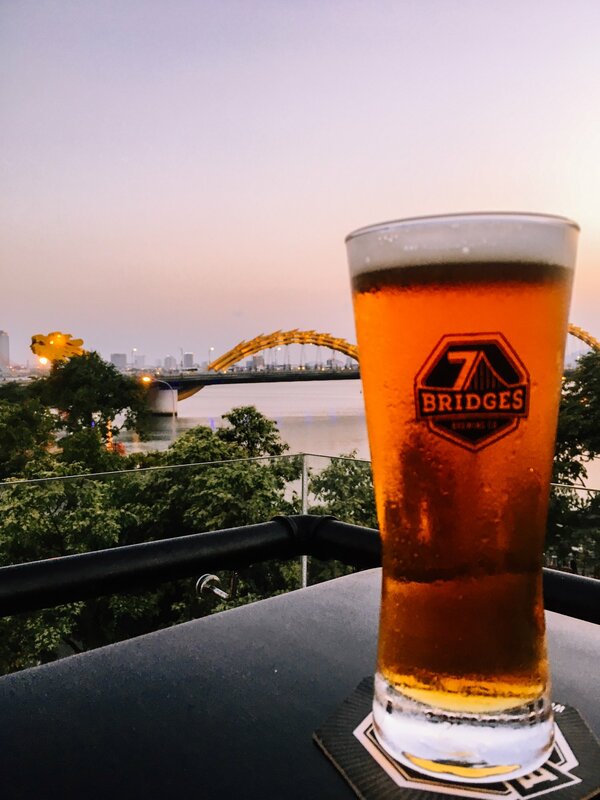 **TIP** Get the best view of the Dragon Bridge from the rooftop of 7 Bridges Brewery, as we mentioned before they have an unbeatable view. They also have the best local craft beers in the city. After the Dragon Bridge, the Sunwheel is one of the most recognizable icons of Da Nang, you can see if from almost anywhere in the city. It’s located within Sunworld Da Nang Wonders amusement park, on the West side of the river. The Sunwheel stands 115m (377ft.) tall and is the 14th tallest ferris wheel in the world. 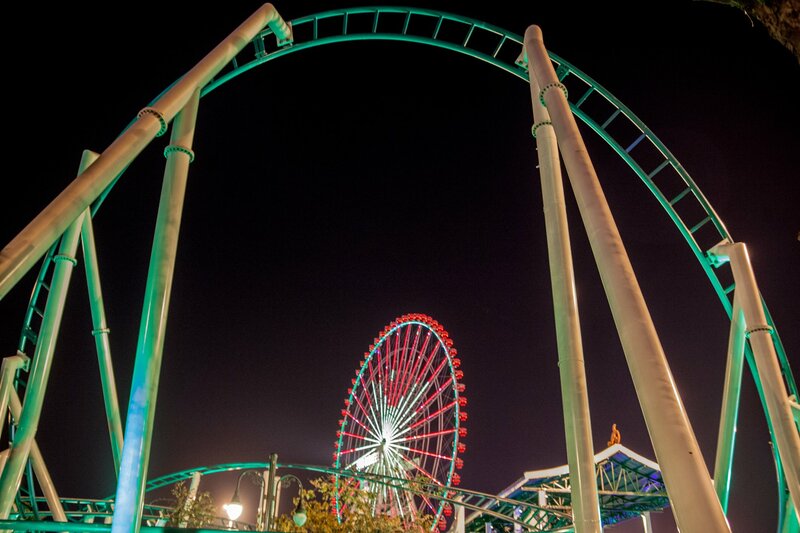 No other viewpoint in Da Nang can match the 360 degree perspective of this ride. We were surprised by the number of rides and attractions at this park as well as the quality. For $10, you can enjoy the whole park... this is a fun and cheap way to spend an evening. Not only are the rides more exciting and scarier than we anticipated, but the park never seems to be crowded so the wait times are very short. They even have a few rollercoasters worth riding. The park is only open from 3pm through the evening, so you won’t have to battle the heat. 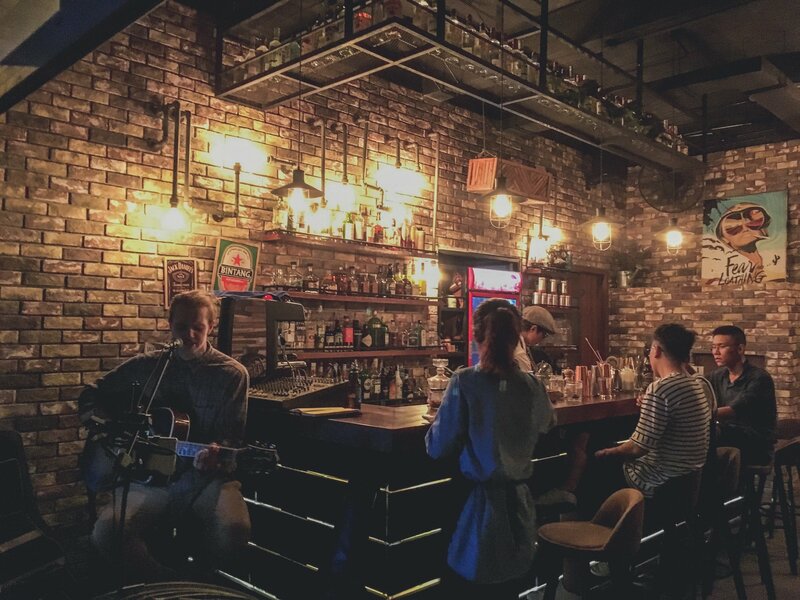 Da Nang’s growing expat scene, has influenced more and more live music, open mic nights, trivia and community events happening around the city. There are a number of great nighttime hangouts, dive bars, cocktail lounges, and social scenes. 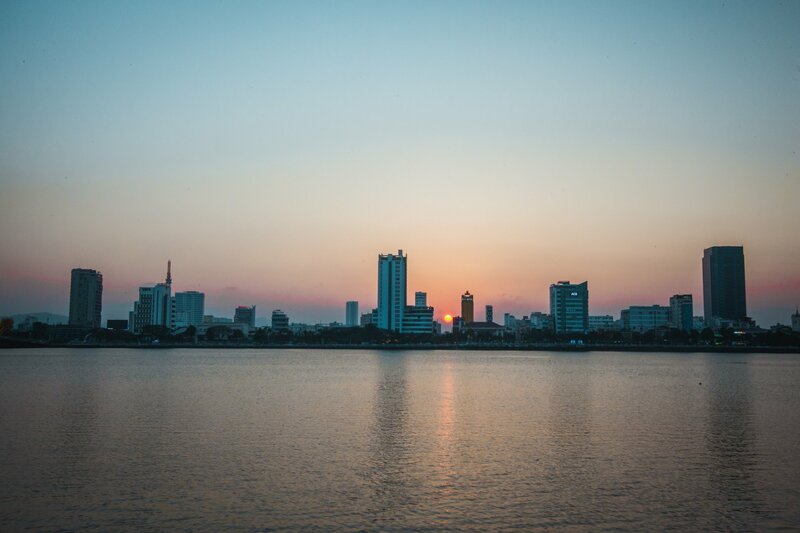 A short walk around the An Thuong Area and you’ll find a spot that fits your vibe. We love the craft cocktails at Wanderlust Cafe, and love the backyard hangout vibes at Crazy Cat Pub. 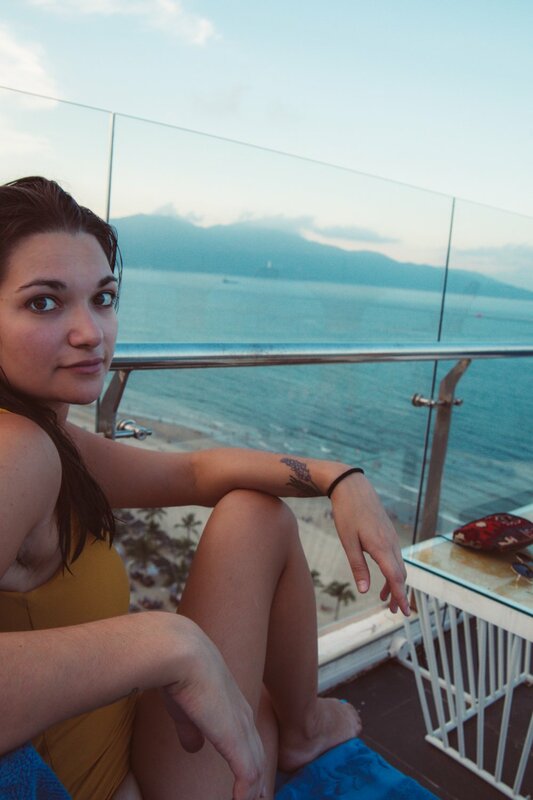 Want more evening hangout recommendations in Da nang? For the outdoor enthusiasts, hiking Marble Mountain is a must. The hike is short, and consists mostly of stairs, but the viewpoints are definitely worth the short climb. If you’re not into the hike, you can pay a little extra to take an elevator up to the first viewpoint. There’s enough to explore here to last you a few hours or a whole day if you check out the other nearby peaks as well. From the top of the first peak you can get a much better feel for the geography of this area. 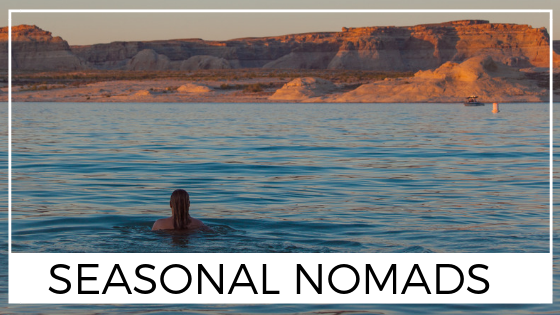 Bring your camera to capture the panoramic views from the beach to the river and the mountains. Due to commercial development, this view will be changing rapidly over the next several years. Don’t miss out on these views before they’re gone. 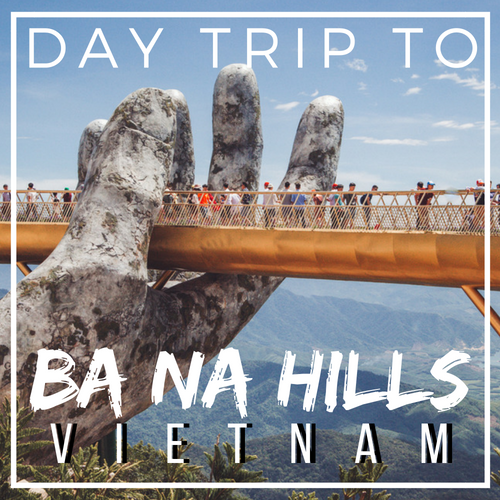 A day trip to Ba Na Hills is the ultimate tourist experience. What was once a mountaintop getaway for the French Colonialists is now a wildly popular destination for Asian tourists, and word is getting out about the Golden Bridge. The weather is cooler on top of Ba Na mountain and the views overlooking the coast are breathtaking. Don’t forget your camera, and not just to capture the view. To get to the Golden Bridge and the Ba Na Hills amusement park, you’ll first ride the World’s Longest Cable Car. 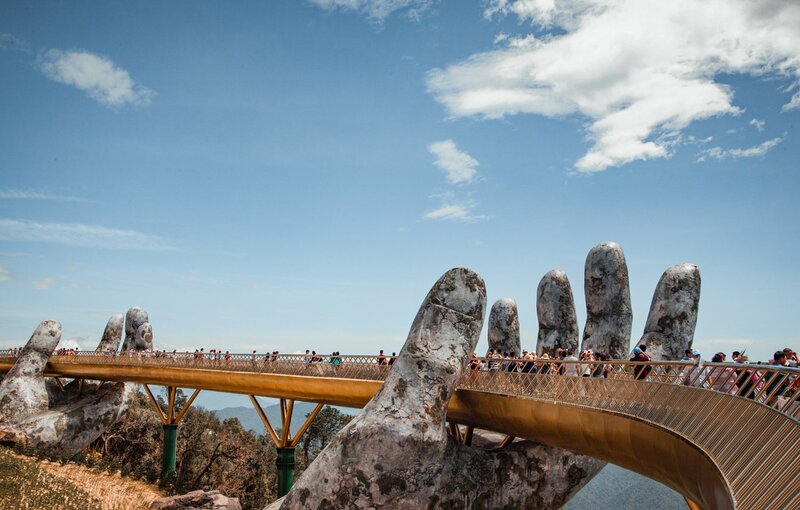 Once you disembark from your 20 minute ride up the mountainside, you’ll see a huge semicircular walking bridge held up by giant hands, which overlooks the hills leading back to Da Nang city and beyond to the sea, this is the Golden Bridge. 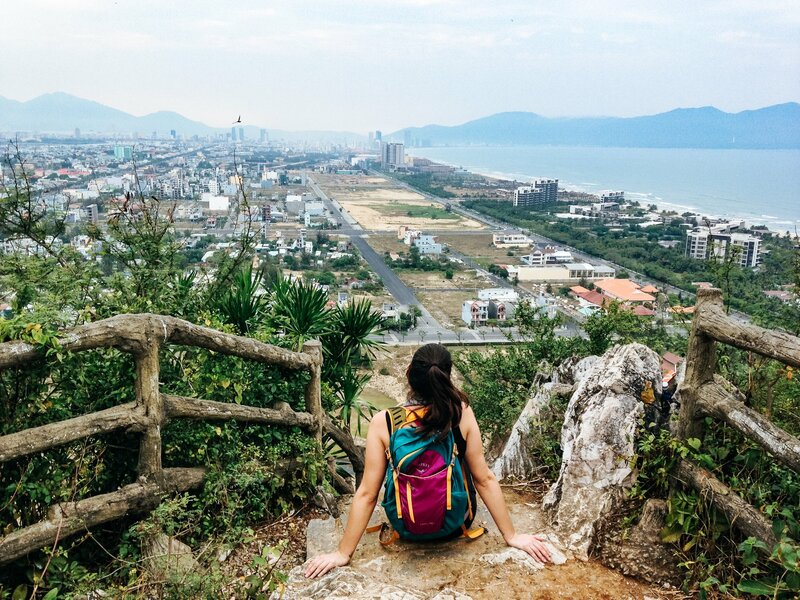 You can get a really cool perspective of Da Nang and the surrounding area from such a high vantage point. The energy on the bridge is electric, with people snapping photos and selfies in awe of this fantastic structure. 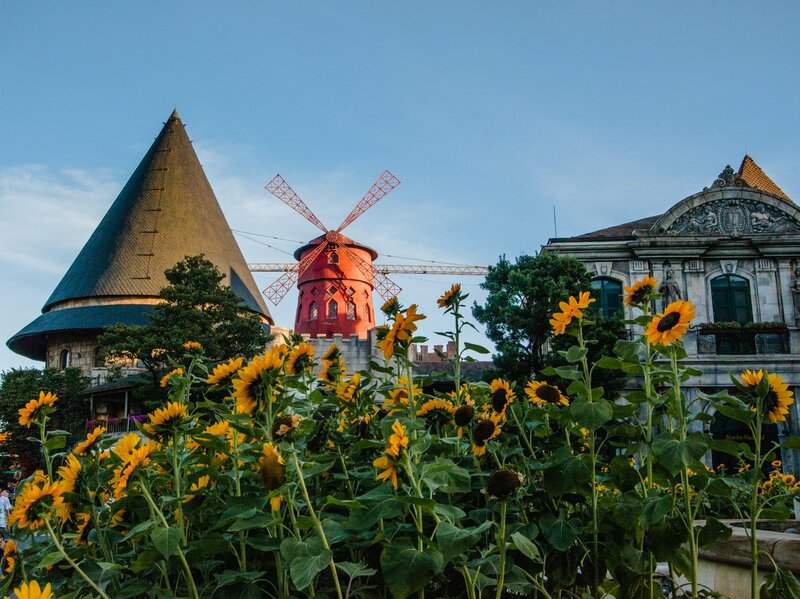 Upon taking a second cable car to the top of the mountain, you’ll find a faux French village, and an amusement park with some fun rides and games on free play. This place has a bit of a Disneyland feel to it without the big goofy characters, mouse ears, and pageantry. The French buildings aren’t too impressive if you’ve been to Europe and seen the real thing. Tickets aren’t cheap, but the cable car ride, the golden bridge, the views, and the numerous instagram opportunities may just be worth the price tag. You can get yourself out there by motorbike, or take a grab or taxi. Alternatively, you can also book a tour which includes your transportation, admission, and buffet lunch. 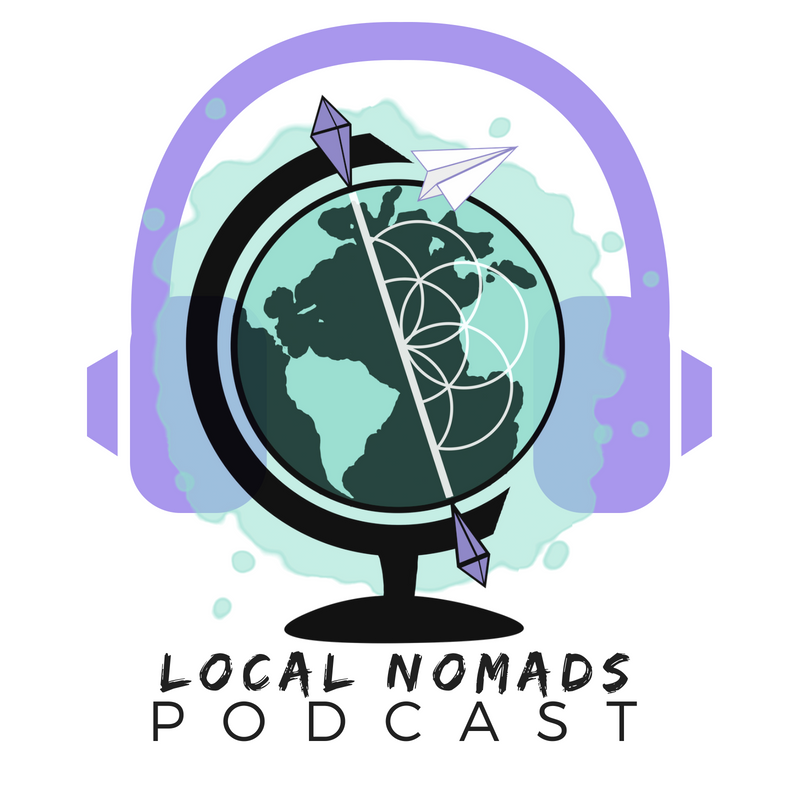 Listen to our Ba Na Hills Podcast Episode! If you’re going to do just one thing on this list, let it be this one. Spending a day on Son Tra peninsula is the best way to get a taste of the natural beauty in this part of Vietnam without leaving Da Nang. 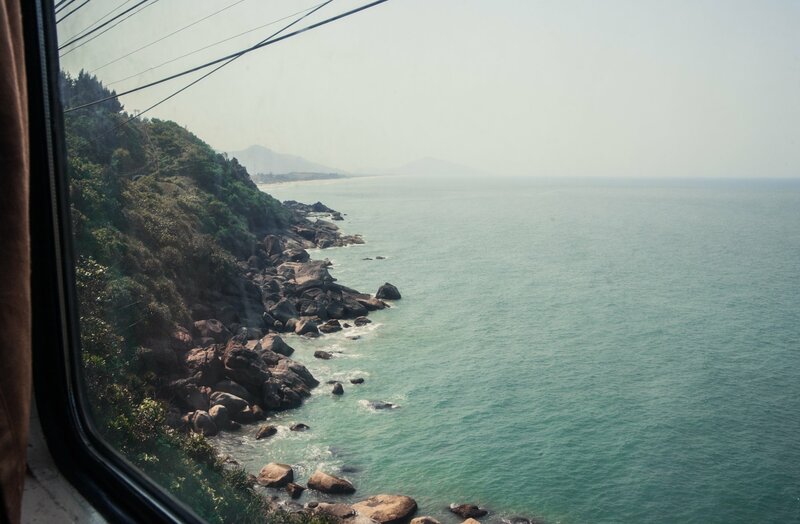 The coastline offers breathtaking views as you ride along the cliffs overlooking the sea. Son Tra is also known as "monkey mountain", and if you're lucky enough you'll catch a glimpse of the mountain's local primates. There are many quiet places to pull off for a photo shoot or just to sit and meditate on a rock. Other notable spots include a small lighthouse, a giant ficus tree, and a statue of a man playing chess at the top. The best way to explore is by motorbike. You can rent a bike in town for about $5/day, or hire a car or grabbike to take you out there. 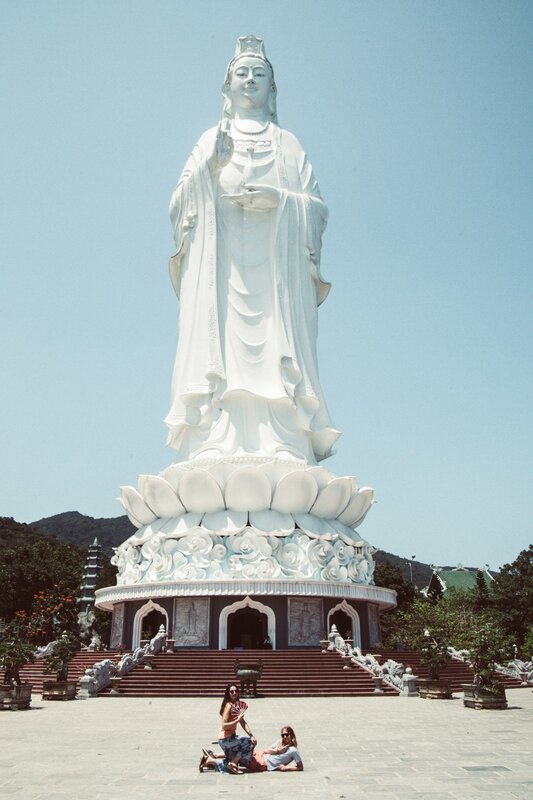 While exploring Son Tra, make sure to stop to admire the Lady Buddha, the tallest Buddha statue in Vietnam. You’ve probably seen her from the beach, constantly watching over Da Nang from her spot on the peninsula. She’s even more impressive up close. There are also some beautiful gardens to walk through on the property, and a few different temples to see too. This perspective of the city from the temple is an added bonus. 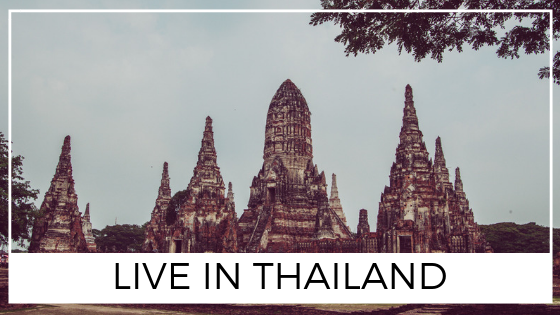 If you’re itching to hit the road on an epic road trip, then Hai Van Pass surely will not disappoint. Connecting Da Nang to the Imperial City of Hue, this coastal mountain pass has very little traffic and rewarding scenery. This has become the most famous road in Vietnam since it was featured in Top Gear’s Vietnam special in 2008. Once you’ve had your fill of Da Nang, pack up your gear and head for Hue. Just over the pass there is a small fishing village known for its fresh and delicious seafood. There are a number of one way motorbike rental services which will help you transport your gear so you don’t have to carry it on your bike. If you aren’t comfortable driving the pass yourself, you can hire a motorbike adventure company like Easy Rider to take the reins while you photograph the entire experience from the back of the motorbike. 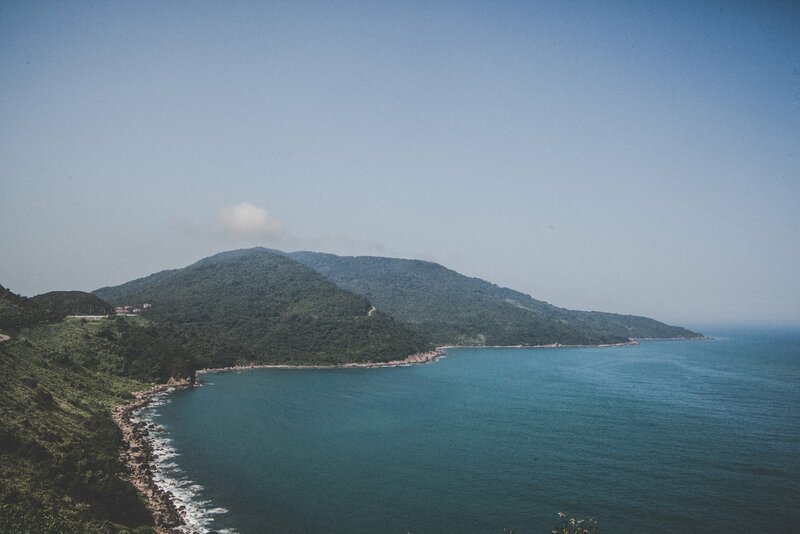 For more info check out this guide to riding Hai Van Pass. 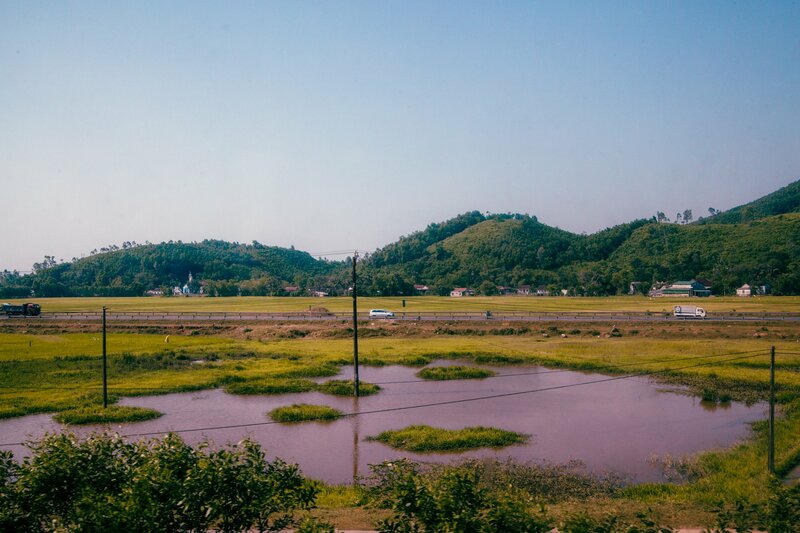 You can also take the train up to Hue (a sleeping car is worth the couple extra bucks for the large window seats) and catch some unparalleled views of the pass, and glimpses of rural Vietnamese life. 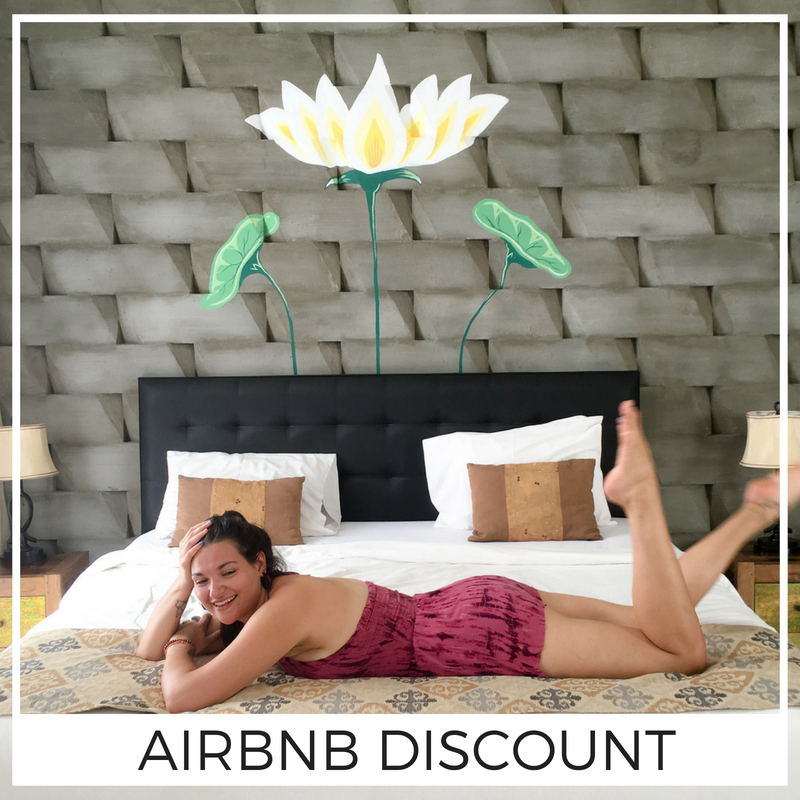 We’ve left the most obvious choice til the end, since after doing all of the aforementioned activities, you’ll likely need some R & R.
My Khe Beach is one of the most stunning white sand beaches in Southeast Asia and is a big draw for tourists and long term expats. Bring a book, enjoy a cool coconut under an umbrella, or join an impromptu game of football with locals. Getting up for sunrise at the beach is incredibly rewarding. Locals fill the beach, doing their morning exercises and getting in a refreshing morning swim. I have it from a reliable source (one of the local nuns) that 5 am is the best time for a swim in the ocean. Practice some yoga and meditation, or take advantage of the free exercise equipment along the beach for the full immersive experience. My Khe Beach gets crowded around 4 or 5pm as well, but in the daytime you can easily find a spot all to yourself. Just don’t forget your towel and sunscreen, and don’t leave any valuables unattended. While generally this area is extremely safe, we did hear of a couple of thefts on the beach. 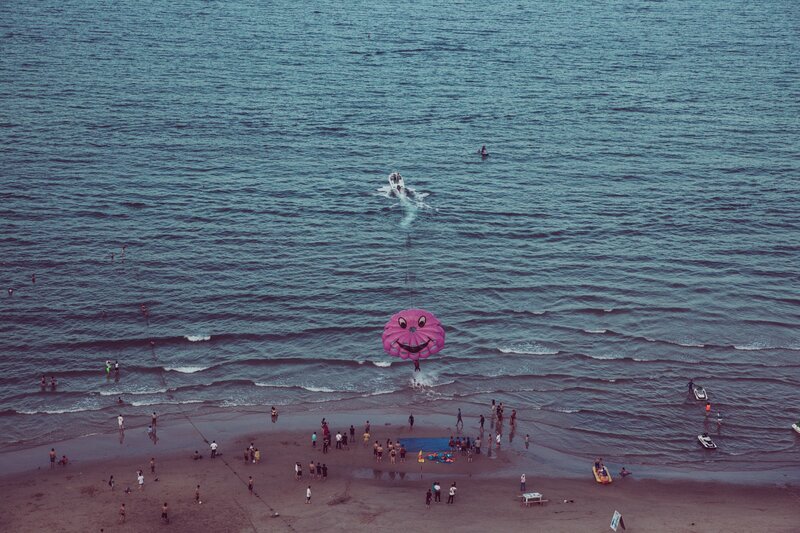 All day long, parasailing boats cruise up and down the length of My Khe beach with tourists in tow. It costs about $25 for a single rider and $40 for a couple. Too steep for us, but worth it if you’re trying to get high, or just need a change of perspective. You’ll take off from the beach and finish with a splash before being picked up on a jetski and returned to the shore. Jetskis are available for rent as well, if you want to take a spin out on the water. For beginner surfers, Da Nang is an excellent choice for its mild waves and consistently warm water. You can book surf lessons through many of the local surf shops. If you don’t have gear of your own, stop into Tam’s pub for an early breakfast and rent your board from one of Da Nang’s local legends. There are other surf shops in town too if Tam’s is already out of gear; try the Surf Shack, Da Nang Adventures or Rom Casa. 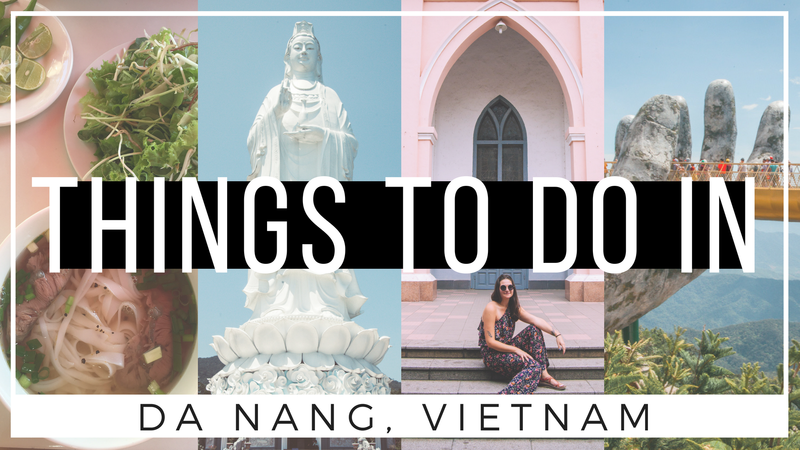 With this list of about twenty different activities, hopefully we’ve busted the myth that Da Nang has nothing to offer travellers, short term or long term. If you’re still feeling like you need more touristic attractions you can check out Art in Paradise, Da Nang’s Trick Eye Museum, or the Upside Down World. Want more cultural attractions? Da Nang has a number of Museums dedicated to art and its military history. There's also a fresco art village where you can take photos with local artists' work. You can also learn about the history of the Cham people, some of Da Nang’s original settlers, by visiting My Son Temple (near Hoi An), the Museum of Cham Sculpture and by touring Cham Island. Have another favorite Da Nang Activity that we didn't mention? Let us know in the comments below. 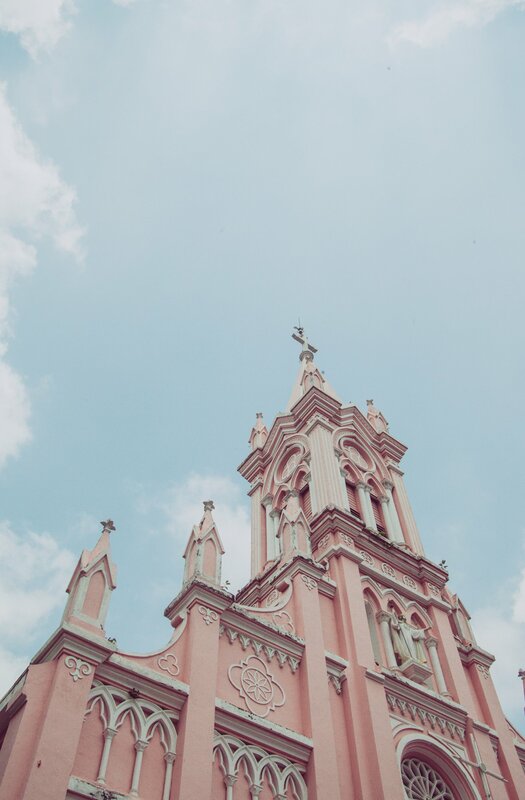 We'd love to check it out! Thank you so much for your useful suggestions. We have had the pleasure of following in your foot steps. 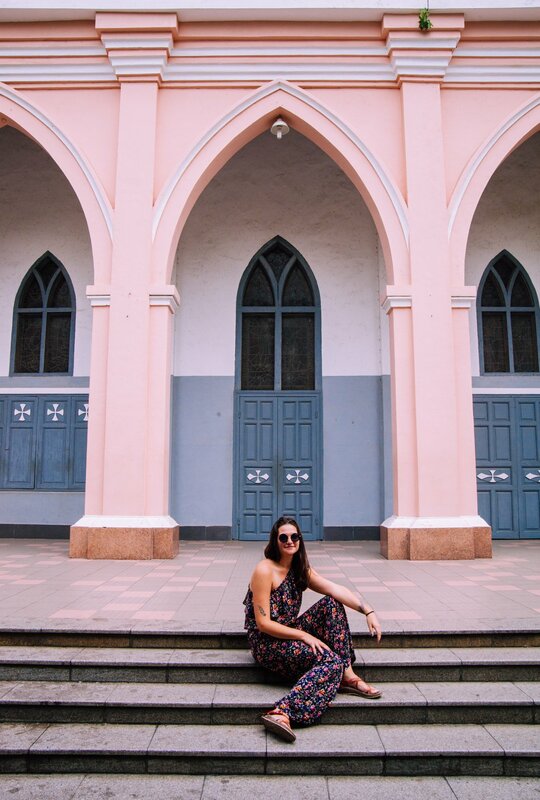 Do you ave a similar blog for Hanoi? Hi Lilly! So glad you’ve enjoyed following us around Da Nang. It’s a beautiful city! 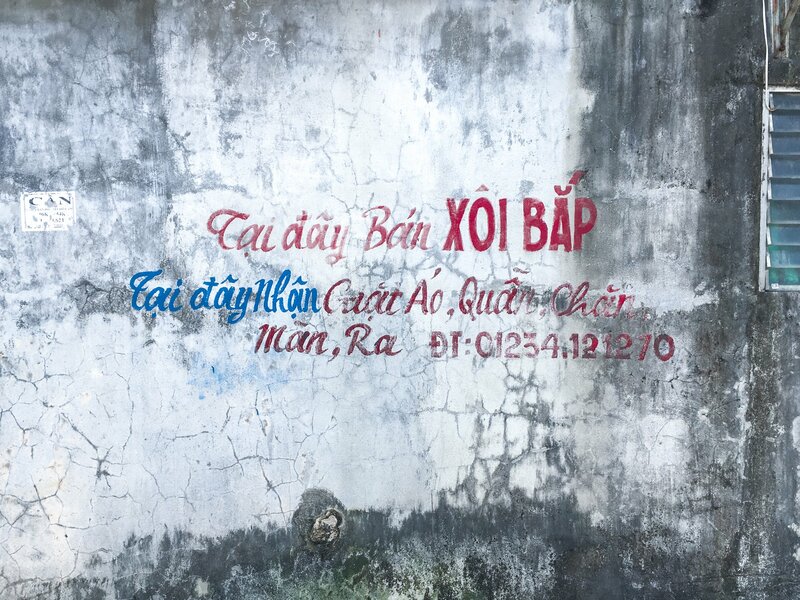 Have you spotted any of our stickers around Da Nang? Unfortunately we only spent a short amount of time in Hanoi and haven’t written about it much. The best hanoi resource I can recommend at this moment is from our friends 2foodtrippers. They have eaten at all the best places in Hanoi and catalogued them in their food guide. Hanoi is awesome. Hope you enjoy! Thank you for a great blog! Very helpful! Thank you for reading it, Lena! I hope you have an awesome time in Da Nang!